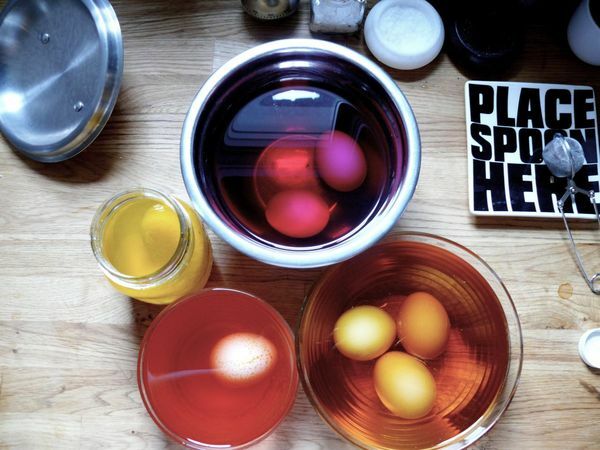 Just a reminder that all of the colour you need to dye Easter eggs can be found in your kitchen. Turmeric, purple cabbage, onion skins and red tea will make lead to real food colouring, as opposed to chemical dyes identified by numbers. My post from my experiment last year details the combos I used to get to the colours above, and my mistake–leaving the eggs in the vinegar-spiked solutions for a bit too long. Unless you want pastel eggs, just softly tinted when a thin layer of shell peels away (pretty in their own right), don’t let the eggs sit for too long. I think this is way more magical than colouring eggs with the store-bought stuff. Kids might think so too, yes? I want to try a bunch of recipes on your yummy yummy site but I assure that tomorrow I’m going to try this! Fun! i hope it turned out well, jen!